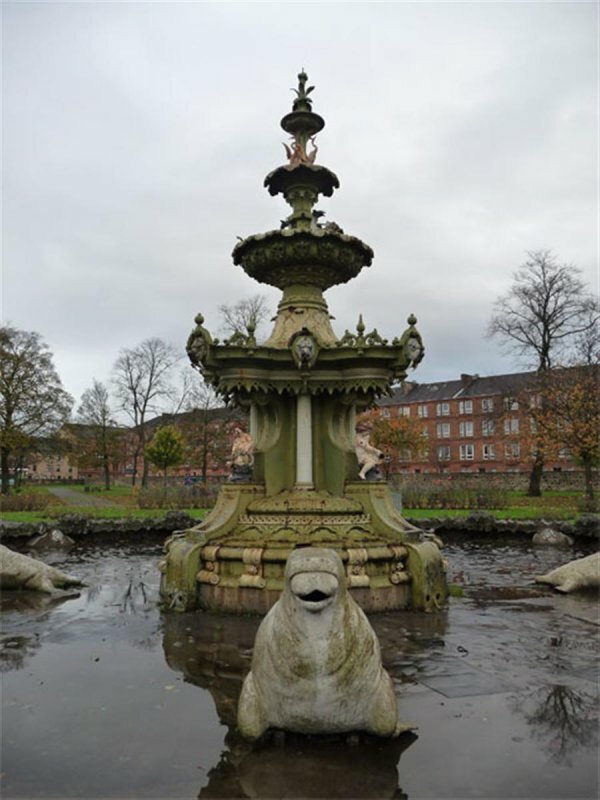 Industrialist Thomas Coats gifted Love Street gardens, which he’d bought in 1866 and engaged Glasgow landscape architect James Niven to re-design, to Paisley Town Council as a 'place of healthful recreation and resort' in 1868. 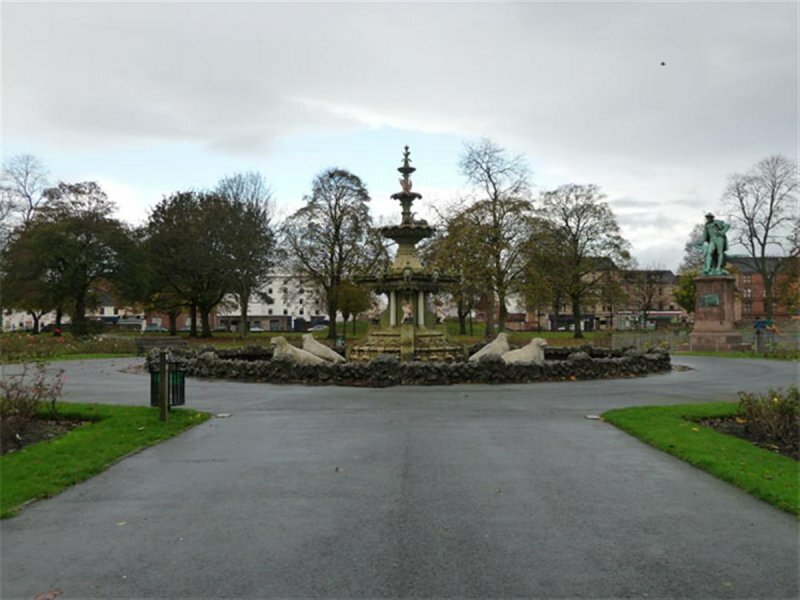 The re-design of the gardens had included the commissioning the fountain and other elaborate ironwork, much of which has been lost. 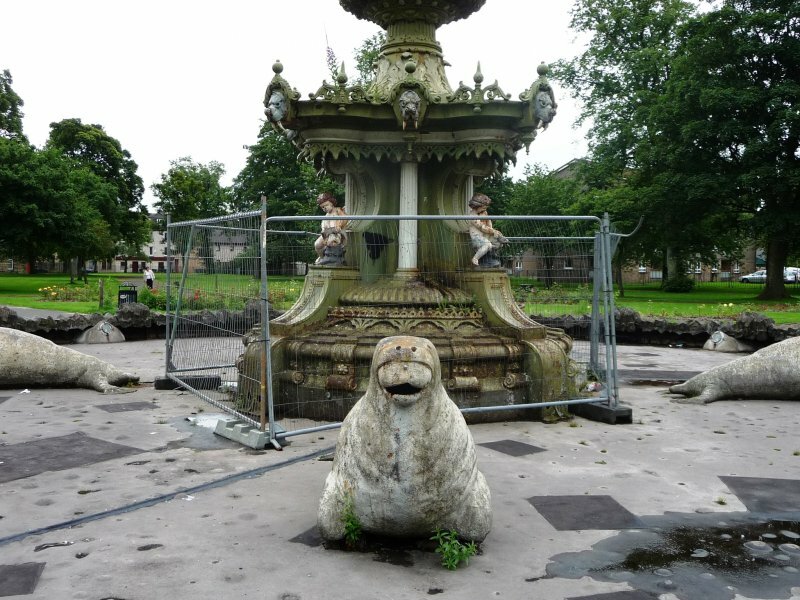 The fountain was a unique commission to the Sun Foundry of Glasgow, complete with putti, crocodiles, herons and porpoises sitting in a basin containing large walrus sculptures, bounded by mock rocks complete with barnacles. 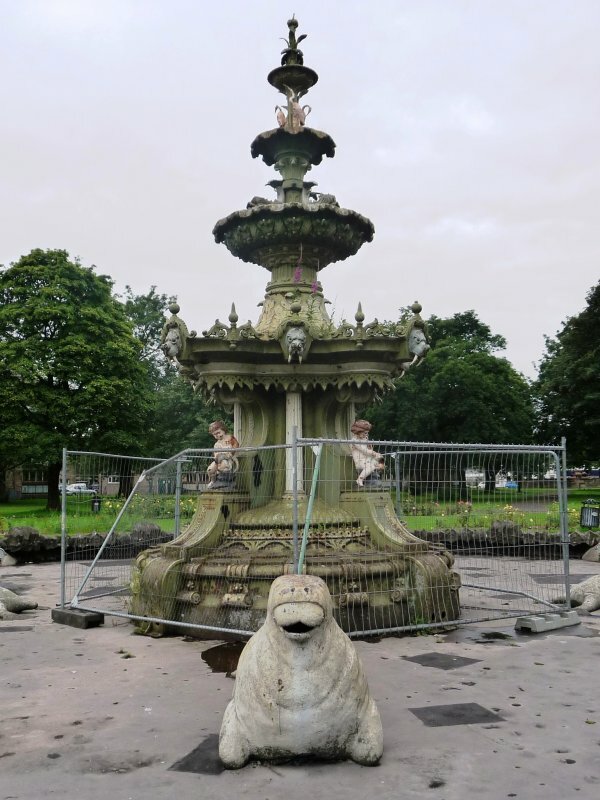 Although much enjoyed by local residents, over time the elaborate fountain had fallen into poor condition and was missing some of its components - the fountain was added to the At Risk Register in 2008. 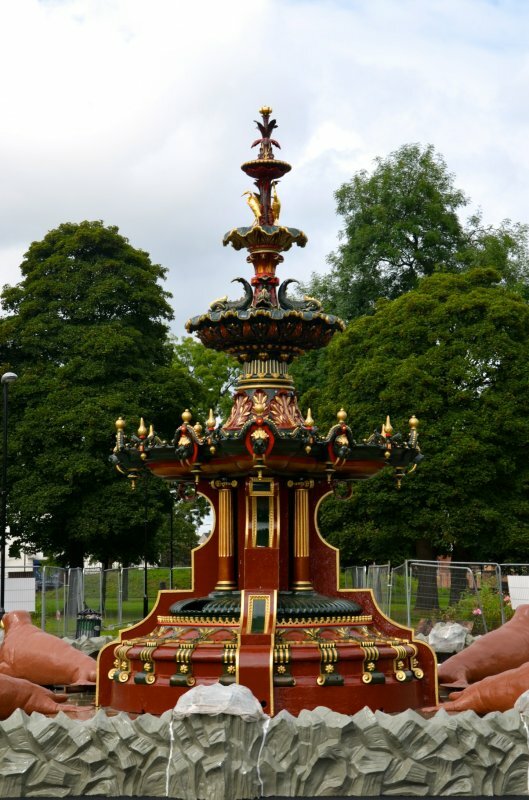 Renfrewshire Council developed a project to not only restore the water fountain but also explore the history of the Sun Foundry and the influence of Scottish foundries across the industrialised world. 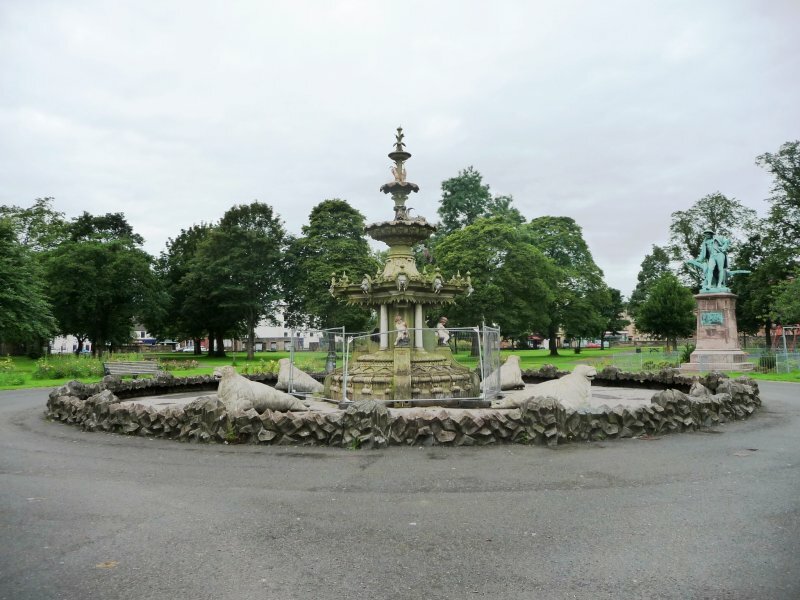 The significance of the gift to the town of Paisley would be investigated through the history of the benefactor, Thomas Coats of J&P Coats and their role in the cotton spinning history of the town and the history of Fountain Gardens and the wider Paisley area. 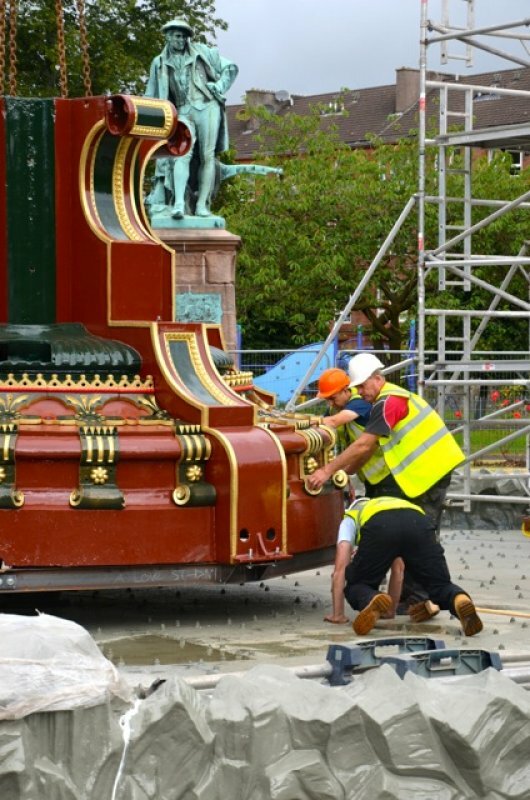 Dismantled, repaired and conserved, the fountain has been returned to its original colour scheme of deep red. 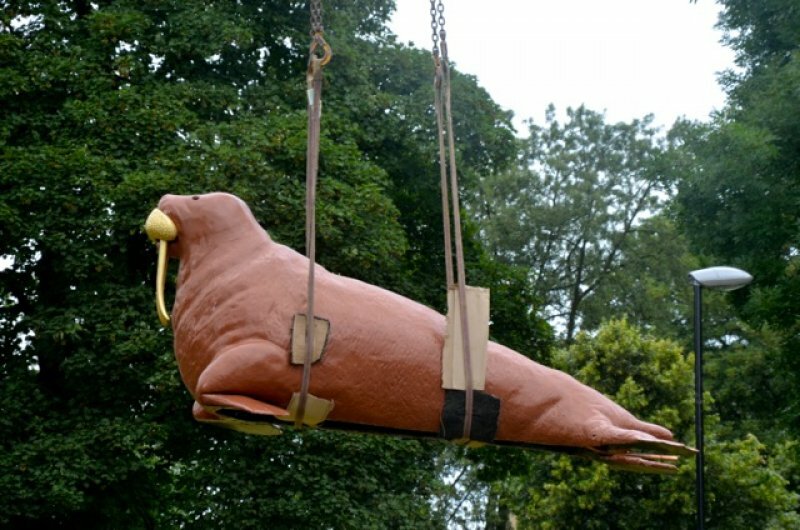 Re-assembled in situ, the fountain has been re-connected to the water supply and brought back into working order. 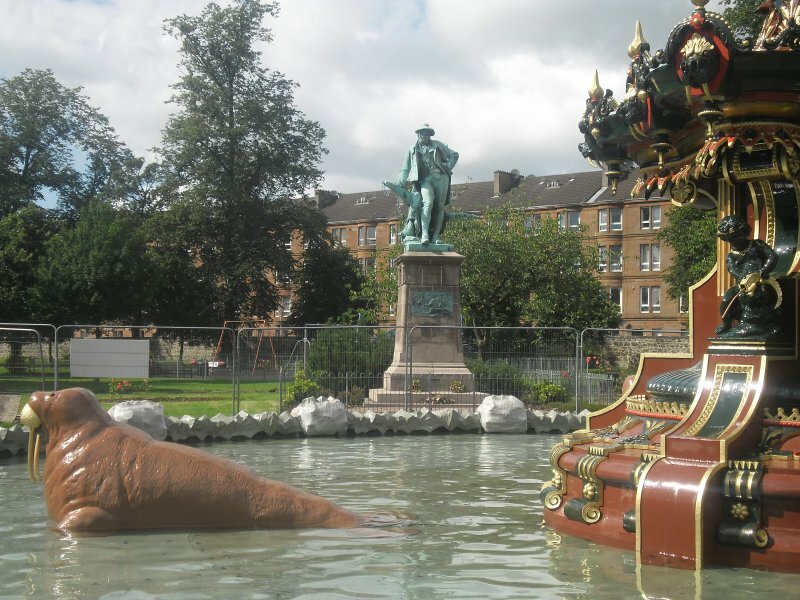 The Grand Fountain was officially opened at a Victorian Garden Party on 6 September 2014, as part of Renfrewshire’s Doors Open Day event and was attended by over 1500 people. 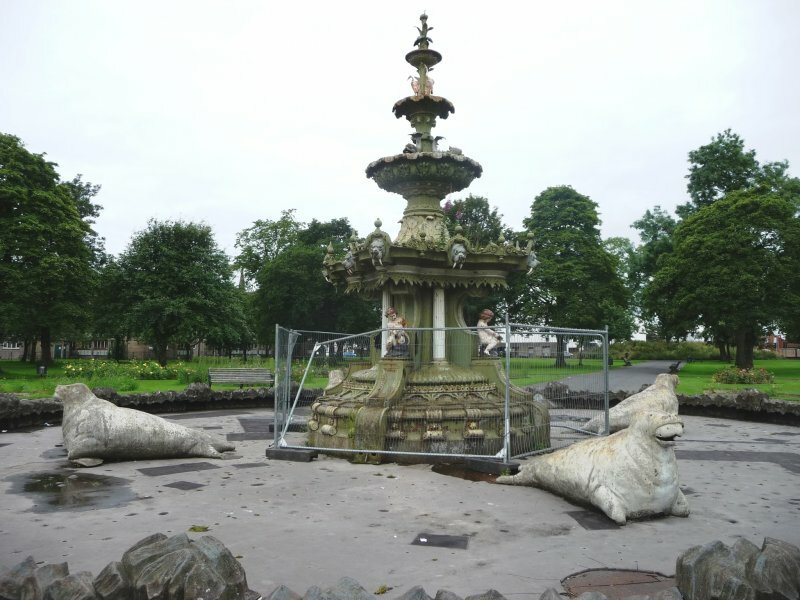 The restoration of the fountain forms part of the wider regeneration of Paisley. 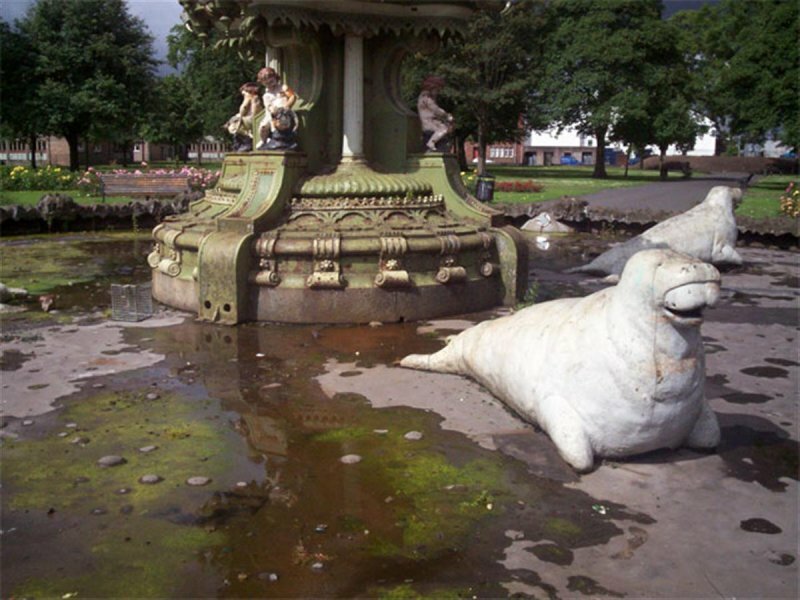 In January 2014 Renfrewshire Council committed to the Paisley Town Centre Regeneration Strategy – to embark upon transformational change to the function and performance of the town based on its heritage and cultural assets. The stated vision for this strategy is: “Paisley will use its outstanding architecture and wealth of cultural assets and collections to drive its economic regeneration and establish itself as an international destination for Scottish culture and contemporary performing arts. 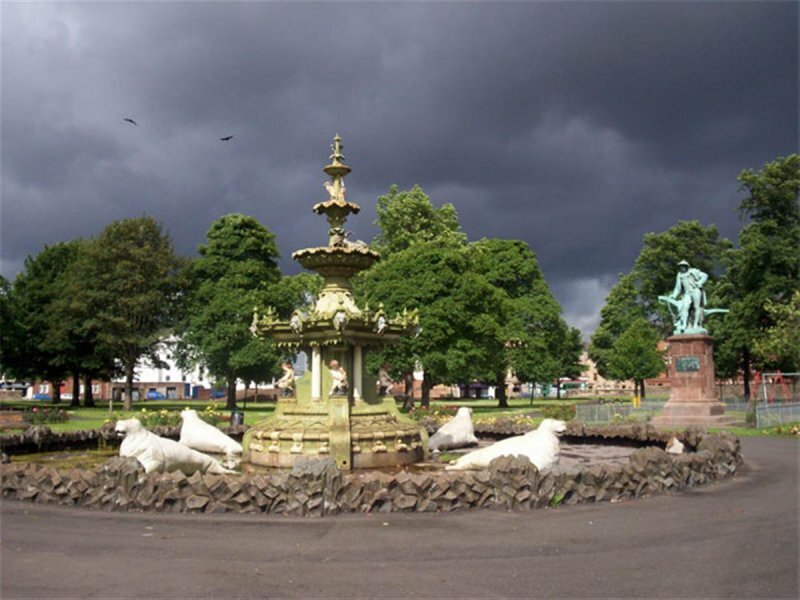 The town will build a new vibrancy by developing sustainable uses within the historic core of the town, rebuilt its high street economy using the audience power of its rich legacy and bring all of its historic buildings into use for the ultimate benefit of the community of Paisley and Renfrewshire”.